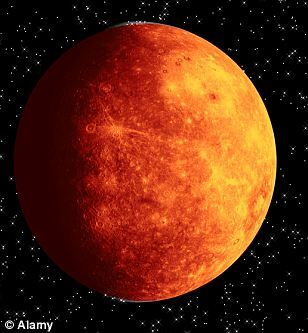 Planet Mercury, “the Merchant of Venice” of the Solar System. This is a planet of versatility, communication, adaptability, sexual experiences and yes business. It represents communication, anything to do with communication – right from a telephone switch to a mobile phone or the IT (Information technology) Industry. This planet is a merchant in true sense and can take high risks. So stocks markets are not far from people governed by this planet. This planet basically rules finances and money. In vedic Astrology, it is called as Budha, actually the word budhi = intellect is connected to Budha= Mercury. On the down side this planet may resent restlessness and lack of focus – leading to mental problems. People who have either Virgo or Gemini as ascendant OR are born in May ending, June Or July ending, August or 5th, 14th, 23rd or Wednesday of any month are governed by this planet. They could be quick witted or say quick tempered, and mental stress is one of the possibilities of this negative personality trait of mercury. Mercury primary aspects 7th house from where it is placed. 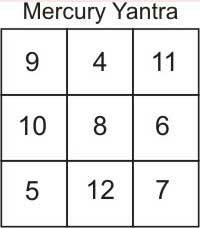 Say if mercury is in 4th house, then aspect to 10th house= career is there. People who have either Virgo or Gemini as ascendant OR are born in May ending, June Or July ending, August or 5th,14th,23rd or Wednesday of any month are governed by this planet. If you are quick witted, have good communications, have good discrimination, good in dealing with money or stocks- be assured mercury is well placed. Else if otherwise- one can know that mercury is afflicted. One could know their exact status by studying your complete birth chart. Your Lucky Colour : Light Grey and White. Emerald in silver. But for wearing in silver- check how strong is your moon. Mercury called Buddha has a relative motion of 65-100 units where in moon is 13-15 units. Mercury has various aspects, These aspects by longitudinal distances have a good deal of utility in astrology or Jyotish.Mercury assumes the characteristics of planet it associates with, so if with a malefic then it becomes bad and if with a benefic it becomes good. So if say waxing moon is there with mercury its good else if waning moon is there it’s bad. Mercury is said to be the karaka of speech. The planet is colored like garss.Maha Vishnu rules planet mercury. Mercury is a neutar. This planet is earth dominated. Mercury dominates the commerce or the commercial community. It is a rajasik planet. Mercury or budha has an attractive physique and the capacity to use words with several meanings. Mercury is fond of jokes- that are jocular in nature. Mercury has a mix of all the three humours. The skin is ruled by mercury. the taste of this planet is mixed in nature. The planet mercury or budha is strong in day and night both. The strength is in east for budha and guru, that is Jupiter. the planet mercury being neutar rules fruitless plants. Black silken clothes are ruled by mercury.sharada ritu is governed by mercury. Mercury rules the living beings the jivas. Mercury is exalted in Virgo sign. It might interest people to know that India’s prime minister sri narendra modi ji , born on 17th September a Virgo( rueld by mercury) is influenced by Mercury. His communication /oratory skills and desire to connect to business people have gotten the interest of many investors all across the world .Also he connected to IT biggies like Facebook CEO(Mark Zuckerberg), Microsoft(Satya Nadella) and Google(Sundar Pichai) and others . Once again IT( information technology connects to Mercury).